Get a free Beef or Chicken Taco at Taco Bueno. 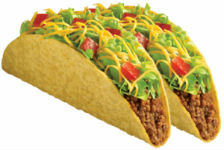 Click on Start Intervention to send a free coupon for a free taco and get one for yourself. This is for the first 30,000 people.